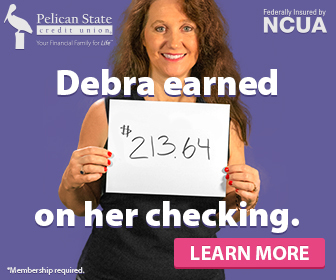 This might be the most difficult and delicious post we’ve ever done for Pelican State of Mind. They said it couldn’t be done, yet here you are, reading about the best king cakes in Louisiana. With Carnival Season here, it’s always fun to ask everyone what place has the BEST king cake. 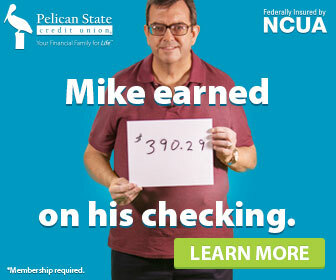 You’ll find that this is a very serious, and sometimes heated, topic down here in Louisiana. Okay, so full disclosure: I am from North Carolina and have never had king cake before! I was not even sure what flavor king cake was, so of course I didn’t realize that there are different king cake flavor options! When I asked around, everyone kept saying to go to Atwood’s Bakery off of MacArthur Drive. I was not disappointed! When you first walk into the building, you are met with the most amazing sight of display cases filled with treats of all kinds. Seriously—it runs the length of the restaurant! I had Saturday brunch that was topped off with a free piece of cake (thanks Atwood’s!) before I ordered my king cake. 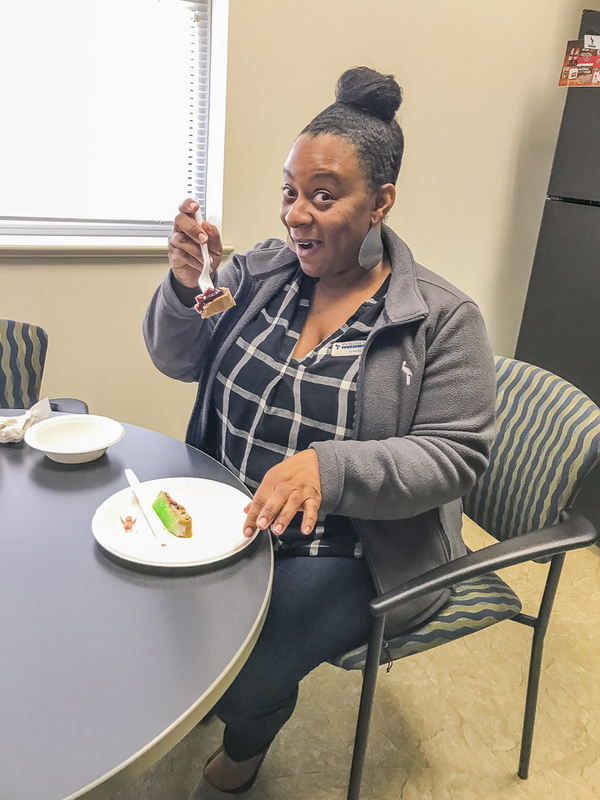 Their personal-sized king cake was filled with cream cheese icing. It only cost me $5.01 after tax! 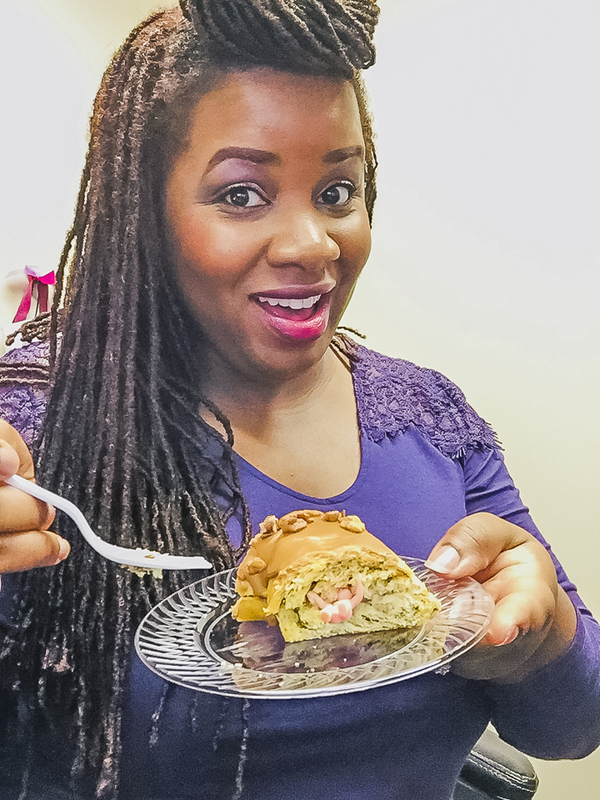 I am a lover of almost any kind of cake and definitely all things with cream cheese icing, so it was a win for me! While I don’t have any prior history with king cake to compare Atwood’s to, everyone’s recommendation was amazing! Atwood’s will be getting a lot of my money in the future because I left full and happy! If you’re ever in the Central or Watson area, you MUST stop by Oak Point Fresh Market! When you walk into the Central location, you get this hometown feel. They bake their king cakes fresh daily. There are a variety of flavors, with two of their specialties being Turtle and Pecan Praline Supreme. Of course, I sampled the Pecan Praline. For a king cake with such freshness and flavor, $17 is a bargain! It is not your typical praline and cream cheese filling. It is such a delightful mixture that you will not be able to eat just one piece. The frosting is also different than any other king cake I’ve had. It has somewhat of a caramel, “praliney” (yes, I made that word up just for this king cake) flavor with pecans baked right on top of it. They also sell mini, personal-sized king cakes and what appeared to be king cake strawberry and cream cheese parfaits. 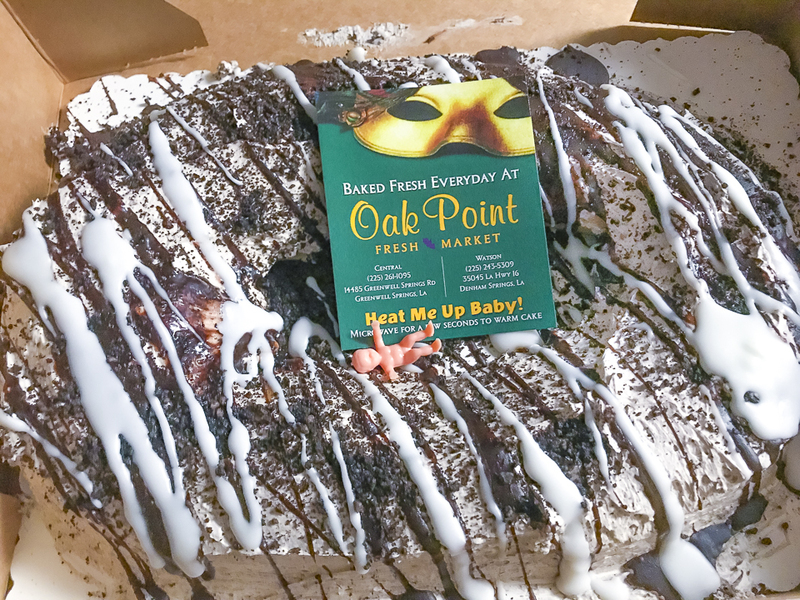 Just a side note: If you’re looking for some fresh food options for dinner or if you have a sweet tooth, there are plenty of options at Oak Point Fresh Market! Everyone is so friendly there! It’s definitely a place you would want to visit and keep going back to. I don’t regularly shop at Ralph’s. (I have been here before because I live close and pass by often, but I’ll start stopping by more since having their king cake!) I stopped in recently to get my hands on a blueberry cream cheese king cake. Ralph’s Market is located on Highway 44 in Gonzales. It’s on a fairly busy intersection but it’s easily accessible. The inside is always clean and organized and the workers are very friendly! This was my first time having Ralph’s king cake, but I went there because they came HIGHLY recommended. THEY DID NOT DISAPPOINT! It was definitely fresh, very tasty and had lots of ooey goodness! There was just enough filling but not too much to overpower the actual cake. It was so good that I will definitely be stopping in to get another one! Being from the New Orleans area, Chalmette to be exact, I’m somewhat of a connoisseur on king cake. New Orleans is the heart and soul of Mardi Gras and king cakes. Chefs To-Go is a family-owned business with a welcoming atmosphere. They’re festively decorated all year round, which creates a cozy environment for their customers. The restaurant sits in the heart of Jackson right on the main highway for easy access. They offer 12 different types of king cakes, each one the same size, for $16.99. They also offer cupcake king cakes. Each king cake comes with a package of traditional Mardi Gras beads. In my years of eating king cake, I have come across two types of king cakes bakeries make—the traditional cinnamon roll-type or the bread-based. Chefs To-Go does the cinnamon type with a twist! We picked the strawberry cream cheese filling for our king cake. 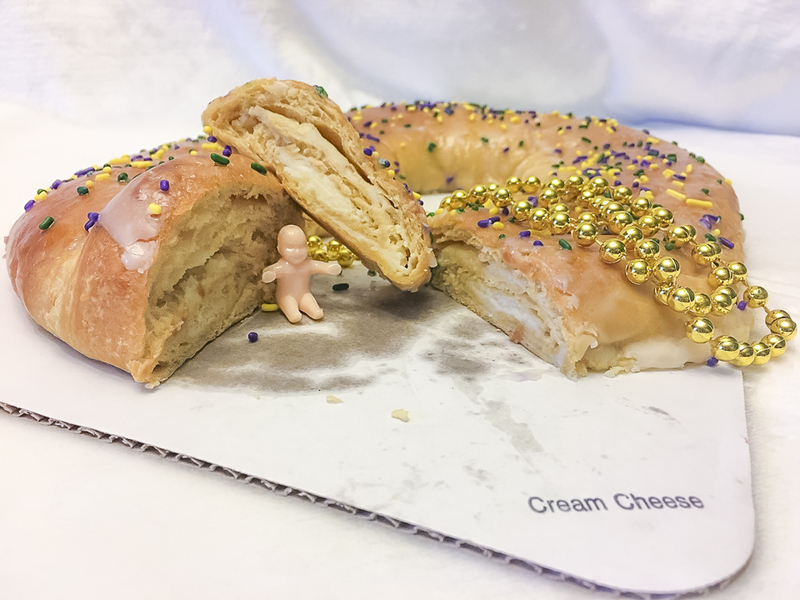 While nothing can come close to that traditional New Orleans king cake, this one comes mighty close! 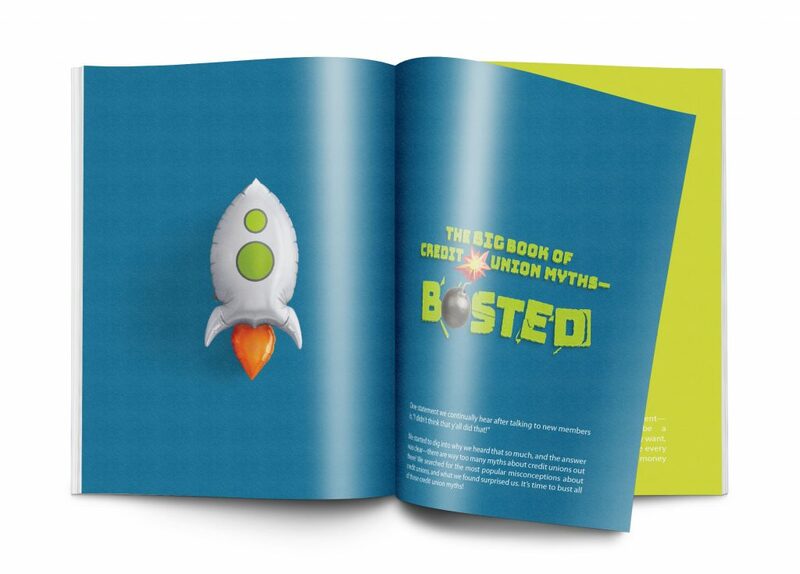 In fact, as soon as we all devoured it, we ordered another one for the branch! Located at 1012 Jefferson Street in the heart of beautiful downtown Lafayette, Keller’s Bakery has been serving savory sweets from this location since 1948. The original Keller’s Bakery opened in Abbeville all the way back in 1885! Since I was a child, Keller’s Bakery has always been my favorite sweet spot, with petit fours as my tried and true go-to treat. On a gloomy Sunday morning, I step out of my car and the delicious smell of fresh baked pastries greets me. My mouth starts to water like Pavlov’s dog. I walk past a window lined with king cakes baked to perfection and ready to be devoured. Memories flood over me as soon as I walk through the door. The bakery’s aroma is nothing short of amazing. Seven warm and welcoming faces behind the counter greet me like long lost family. I instinctively scan the selection behind the glass, taking in all the cookies, pies, cakes, breads and pastries. I would normally order a dozen assorted cookies and a dozen petit fours, but today I am on a mission to buy something I have never experienced: a Keller’s Bakery king cake. After a very short wait and $15 later—mission accomplished. All that is left to do is to sample this deliciousness. Other king cakes I’ve tasted were sweet. So sweet, in fact, you can have a tiny slice and your sweet tooth would be satisfied immediately. That’s not the case with Keller’s king cakes! Keller’s seems to have perfected the balance between sweet and savory. Stuffed with cream cheese and covered with glaze straight from heaven, I fight the urge to try to eat the whole thing! The cream cheese filling is velvety smooth and not too rich, enveloped in a fluffy, baked-to-perfection Danish pastry. The official taste test result? An eleven out of ten on my King Cake Scale! I’ll definitely be back for another one—I need to sample the variety of flavors they have to offer. After all, I need to make to ensure my enthusiastic recommendation is valid. 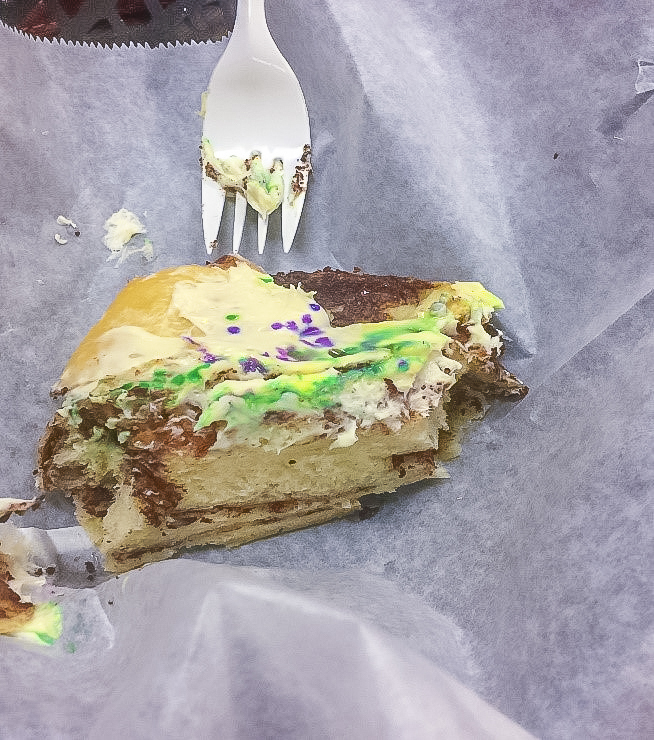 Call it my sweet sacrifice on behalf of the scientific method and king cake heaven! I have been dubbed the “king cake snob.” This is because I was raised eating authentic and traditional king cake. The best king cake in Louisiana is Manny Randazzo’s, hands-down. 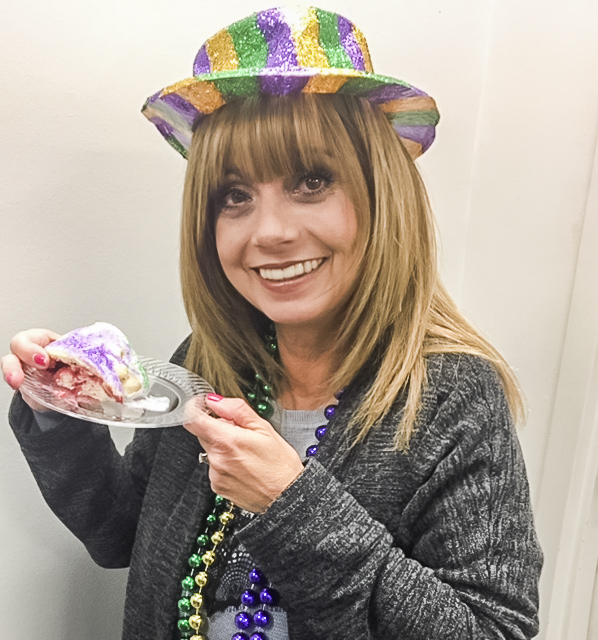 I have had many king cakes, and NONE compare to the flavor and freshness of Manny Randazzo’s. It is worth the wait in line (yes, I have stood in the cold and rain) and worth every single penny! Do yourself a favor. 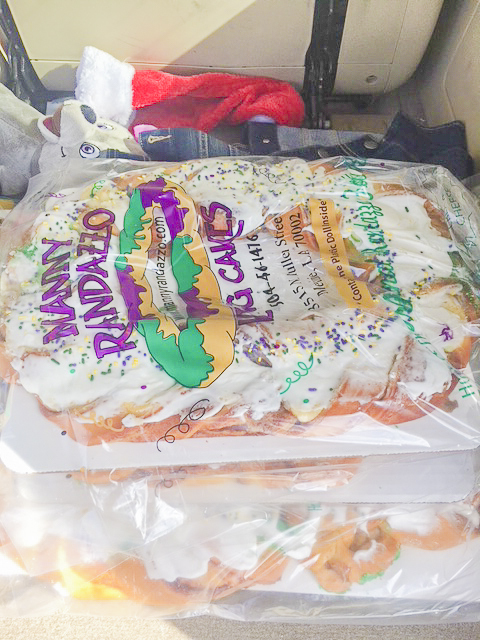 Hop in your car, crank up some Fats Domino and drive to Manny Randazzo’s for the best king cake of your life! Laissez Les Bon Temps Rouler! It’s Carnival time! So I made a post asking my Facebook friends in the area who has the BEST king cake since I’m not a native of Monroe. I got quite a few people telling me that I should check out Daily Harvest Deli & Bakery, so I knew that was the place to go. It’s located at 1105 Forsythe Avenue, which is in the heart of Tiger Country. The first thing I noticed that I absolutely loved is how quiet the place is. It’s the ideal place to enjoy a quiet breakfast, lunch or snack. 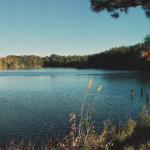 It’s a place that you can come to study or get some peace of mind. Back to the “King Cake Chronicles.” They had SOOOO many flavors to choose from which included cream cheese, cinnamon, strawberries and cream, blueberries and cream, and also pecan and cream. I had a small, and the price was definitely worth the experience! I kept it traditional and had the cinnamon which was NOTHING short of amazing. It had such a fresh bakery taste which definitely matched the aroma coming from the king cake itself! Upon taking a bite, it literally melted in my mouth, leaving my mouth watery and wanting another bite. This pretty much explains why I ate most of it before capturing my photo. SORRY, but it was just that good! Daily Harvest & Bakery is on my YES list and should be on yours too! 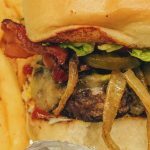 Whether you are from the area, just passing through, or if you’re a travel junkie who loves to try new food, make this place your next stop and thank me later! 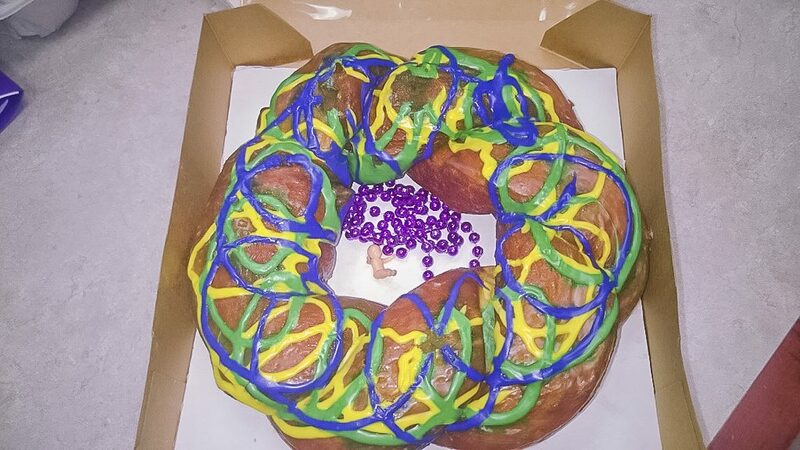 Nothing says Mardi Gras quite like a king cake. When it comes to finding that perfect cake, where, oh where do you start? I cannot explain how much I love a sweet, flavorful king cake. This year, I bought my cake from Mikey’s Donuts in New Roads. Mikey’s is my favorite little hot spot because not only do they make fresh, delicious fried king cakes, but they also have two different sizes that you can order and several flavors to choose from. If I’m being honest, I’m a sucker for raspberry cream cheese! I ordered the small king cake, and for a bargain at $10.99, I certainly won’t complain. 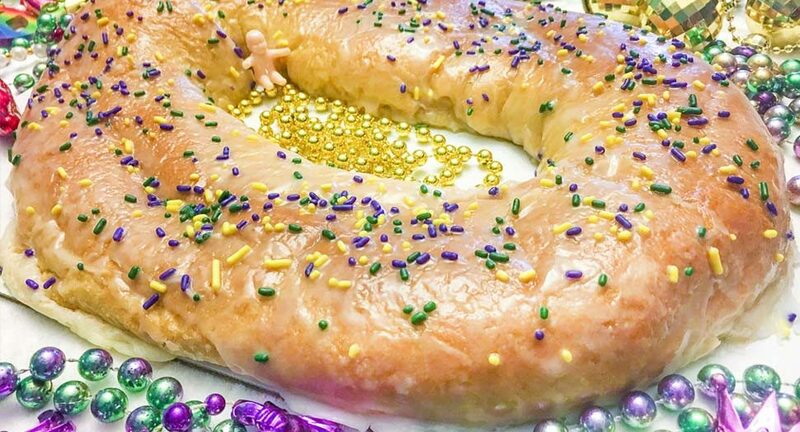 This king cake will make anyone weak in the knees! 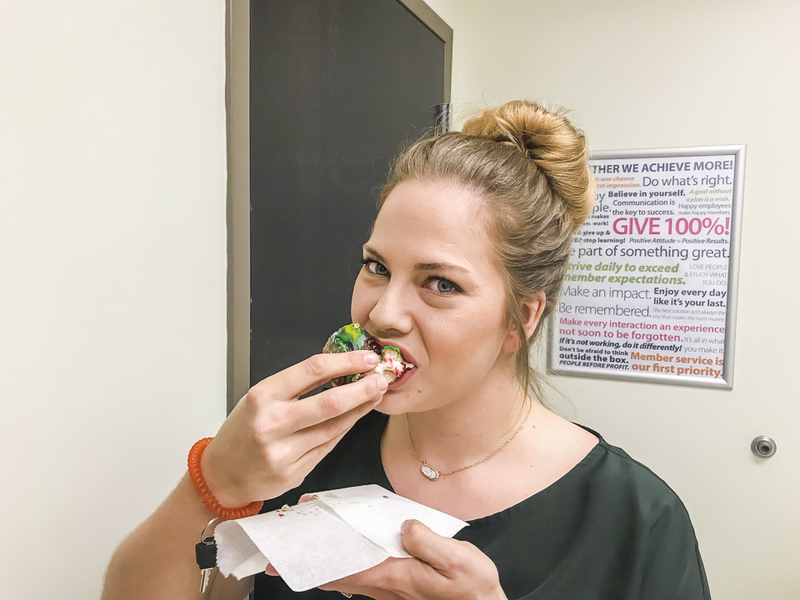 If you find yourself with a need for a rich, delicious king cake and you happen to be in the area, go see my girls at Mikey’s Donuts in New Roads on Hospital Road! The best king cake in Opelousas is Mikey’s Donut King. They’re located right off of I-49, so it’s easy access in and out. 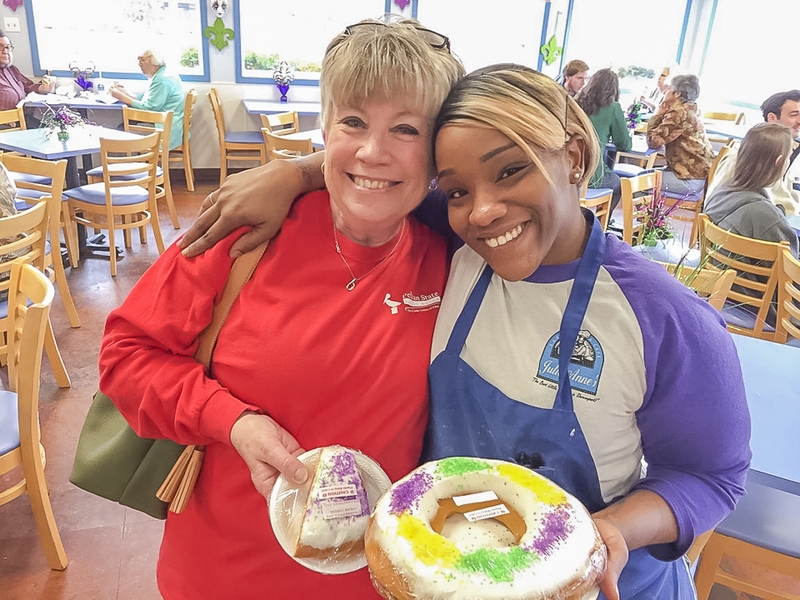 The service is always fast and friendly, and the donuts and king cakes are amazing! I’ve been here plenty of times before for donuts, but everyone raves about their king cakes. I recently tried one, and it was AWESOME! I got a plain king cake with no filling. It was $10.98 and worth every penny. It’s so good! It’s not dry at all like a lot of king cakes out there. I would definitely recommend that anyone passing through Opelousas (maybe if you’re down for the Courir de Mardi Gras in Mamou) should stop by Mikey’s and get a king cake. 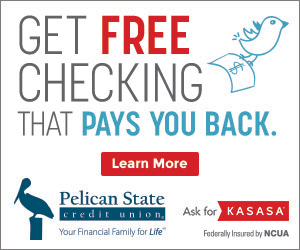 Pelican’s Pineville branch is a frequent visitor of The Batter’s Box. They are a locally-owned bakery that sponsors the youth baseball teams in the area. They are located at 5010 Shreveport Highway, and the atmosphere is amazing! There are pictures of the baseball teams they’ve sponsored over the years and family pictures too. On our recent visit, we got a large king cake to share. 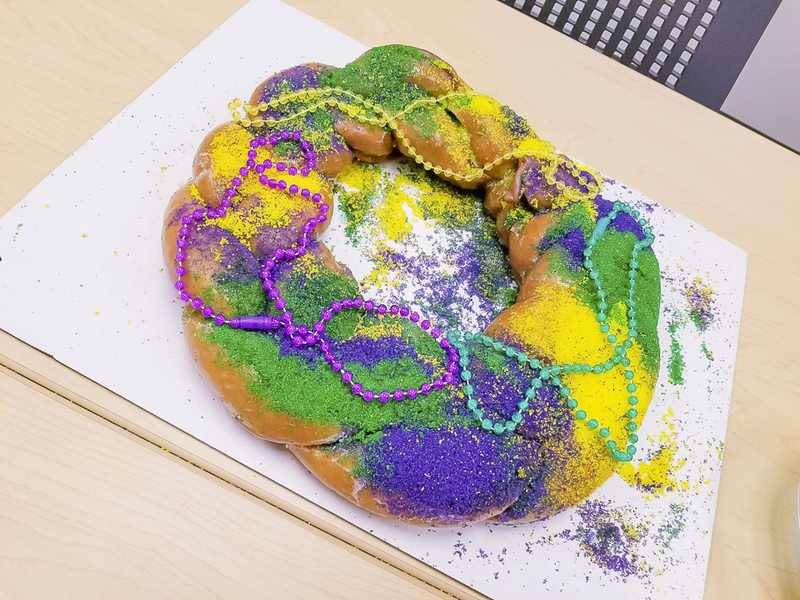 This king cake was a home run. It tastes like a large, amazing donut! It’s sweet and moist, and it reminds me of this twisty, cinnamon-y donut they sell there. It might seem a little pricey at first at almost $21, but it is definitely worth it! 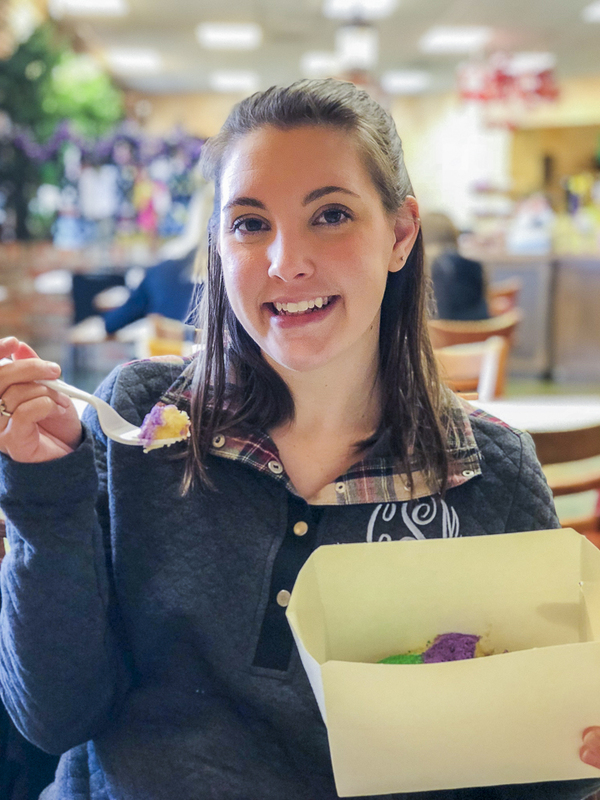 If you find yourself out in Pineville, make sure to stop by and grab one of their amazing king cakes, and if they’re not in season, get one of their donuts. You won’t be disappointed! When looking for local spots famous for their king cakes, it’s hard to choose just one. 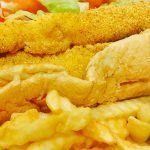 In Shreveport and Bossier City, there are three that offer the best! Julie Anne’s Bakery and Café is a quaint little spot on Kings Highway. I have frequently enjoyed lunch there. Their baked goods are awesome! I love their petit fours, and their king cakes are amazing as well! Lilah’s Bakery is a very small establishment located almost in a residential neighborhood near Centenary College. Inside, it looked like king cakes were the only product they were selling. I met the owner, took a picture with him and he recommended his best king cake for me to try. It was absolutely delicious! Tubbs Cajun Gifts Hardware Store is the most advertised. They brag that they have the most extreme king cakes. They are the oldest hardware store in Northwest Louisiana—open since 1922! The king cakes were delicious. I could not decide which flavor to choose so I tried a sliver of all three they had available (strawberry, blueberry and cinnamon extreme). It was fantastic, and I was not disappointed! All three have slight variations in dough texture and filling, but they are each the best in their own right! Oak Point is WHERE IT’S AT for king cake! I recently moved out to Denham Springs, and my wife showed me this video on Facebook that was going viral. It showed them making an OREO king cake in their bakery. My wife’s eyes get huge, and she gives me this smile that I’ve come to learn means, “We’re about to spend some extra money.” I look at her and say, “Do we really need two king cakes?” Bad move on my part. I now know that that’s a foolish question to ask; the answer is always yes. So we walk out with two king cakes—an OREO and a berry Chantilly. We get home and cut some slices of each one. I’ve gotta say, she always has the best ideas—they were phenomenal. The OREO one had crumbled cookies throughout with a cream cheese filling, and the berry Chantilly was literally the best king cake I’ve ever tasted. If you have a sweet tooth and want a new king cake experience, you NEED to stop in to Oak Point and grab a king cake (or two)! You’ve heard our picks, now tell us yours—where can you get the BEST king cake in Louisiana?